This entry was posted in osde and tagged exif, flickr, geocode, location, privacy on 27/05/2017 by osde8info. This entry was posted in osde and tagged gnu/linux, samba, smb, windoz on 26/05/2017 by osde8info. This entry was posted in osde and tagged 10, 7, amd, sempron, vista, windoz on 26/05/2017 by osde8info. This entry was posted in osde and tagged live, uk, webcams on 22/05/2017 by osde8info. This entry was posted in osde and tagged amd, ddr, ddr2, ddr3, intel, memory on 21/05/2017 by osde8info. This entry was posted in osde and tagged 32bit, 64bit, browser, firefox, mozilla on 21/05/2017 by osde8info. This entry was posted in osde and tagged css, education, html, ide, mozilla, training on 21/05/2017 by osde8info. 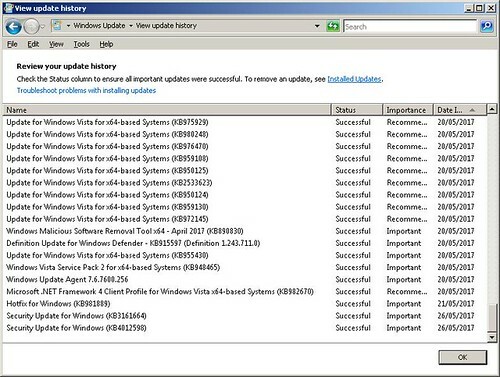 Note that MS are EVEN taking the highly unusual step of providing a security update for all customers to protect Windows platforms that are in custom support only, including Windows XP, Windows 8, and Windows Server 2003. This entry was posted in osde and tagged anti-virus, cso, windoz, wxp on 20/05/2017 by osde8info.